The 66th Postmaster General of the United States, Paul Nestor Carlin, age 86, died on Wednesday, April 25, 2018. He was born on August 25, 1931 in San Diego, California. From birth to death Paul was an achiever. Finding work as early as the age of 10, Paul learned that he liked to work hard. He applied his persistence to running and became an All-American in Track at the University of Wyoming where he met his wife Sue and graduated with undergraduate and graduate degrees in Political Science. He served as a Captain in the U.S. Army and a Major in the Army Reserves. 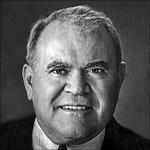 His working career was primarily in Washington, DC as a lobbyist and Postal Executive. He was instrumental in bringing together the final agreements to pass federal laws to provide equal education for each child, to insure technology was a part of each classroom, to set aside wilderness areas for public use and to change the US Post Office into the independent federal agency renamed to the United States Postal Service. He served as a senior executive with the USPS for 17 years, instituting professional management practices and independent financial solvency for the organization. After retirement Paul built and sold two companies which brought hybrid mail innovations to the postal industry. Despite a robust public life, Paul and his wife led a very private personal life and Paul was particularly proud of their 63 year marriage. Together they travelled the world, but found quiet enjoyment at their home in McLean, VA.
Paul was especially close with each of his children, grandchildren and great-grandchildren; plus many nieces and nephews. He leaves behind four sons and spouses – Joseph and Shirley of Cary, NC, Robert and Leslie of DaCun, Taiwan, Thom and Mary of Salisbury, MD, and Mark and Liza Mae of New York City, NY; two grandchildren and spouses – JP of Cary, NC and David and Laurel of New Bern, NC, and three great-grandchildren – Kai, Gideon, and Sydney. Paul will be interred at Arlington Cemetery at a time determined by the cemetery and a Celebration of Life service will follow the interment.